So much for musicians’ mystique: Today, fans enjoy an unprecedented degree of intimacy with the artists they love via social media. Sure, some stars calculate their disclosures carefully, knowing millions will scrutinize each post. But many others seem to engage social platforms more spontaneously, sharing in ways that range from endearing (Taylor Swift shouting out fans) to uncomfortable (the Ariana Grande-Pete Davidson romance roller coaster). For better or worse, the distance between artists and their listeners seems drastically condensed, a reality that is swiftly reshaping the music industry. But if social media platforms encourage stars to divulge personal details, they also reveal much about the fans who follow them. In this project, we studied the demographic composition of various artists’ followers on Facebook, using a tool called Audience Insights. Which states are particularly fond of The Beatles, and which age groups are most enamored of Beyoncé? Do progressive fans favor hip-hop artists, whereas conservatives prefer country? Which artists appeal particularly to men or women? For answers to these questions and many more interesting insights, keep reading. Anthems of female empowerment speak to a particular audience: Among fans of Kelly Clarkson and Pink, women outnumbered men roughly 3 to 1. With assertive tracks dating back to the 2000s (remember “Miss Independent” and “Stupid Girls”? ), these artists have consistently emphasized the strength of women in their work. In this regard, they were historically preceded by TLC, the influential ’90s R&B group with a 74 percent female fan base on Facebook and 4.5 million likes on their fan page as of November 2018. Indeed, powerhouse R&B vocalists were well-represented among the most female-dominated fan bases. Among fans of Whitney Houston and Alicia Keys, for example, approximately 7 in 10 were women. At the opposite end of the spectrum, men accounted for nearly 4 in 5 fans of Starship (the pop-centric outfit previously known as Jefferson Starship). Eminem also possessed a particularly masculine fan base, perhaps because his infamously sexist lyrics deter some female listeners. Several soulful crooners from decades past also seemed to appeal predominantly to men, including the Commodores, James Brown, and Marvin Gaye. Moreover, two classic rock mainstays, Bruce Springsteen and The Rolling Stones, were most beloved by men, calling attention to the way the genre has historically privileged the male perspective. If the appeal of acts like The Beatles seems universal, fans of the Fab Four are particularly concentrated in certain places. Oregon surpassed all states for The Beatles fans per capita, while Mississippi had the fewest enthusiasts (despite the band drawing deeply from blues traditions forged in the state’s Delta region). Conversely, Mississippi and other southern states were a hotbed for Elvis fandom. Arkansas ranked first in fans of the “King of Rock ’N’ Roll,” and Tennessee, home to Presley’s iconic Graceland residence, took third place in Elvis fans per capita. Elton John, meanwhile, enjoyed an extreme concentration of fans in Louisiana, a state he has mentioned occasionally in his lyrics through the years. John also had a robust fan base in parts of the Midwest and Northeast, particularly in Michigan and Maine. Meanwhile, New Mexico boasted the greatest number of Madonna fans per capita, followed by Nebraska. For a singer who once declared “I Love New York,” Madonna seems to be disproportionately appreciated by residents in rural areas. Some artists’ appeal seemed to transcend demographic divisions: Among both men and women, Aretha Franklin fans were relatively evenly distributed across age groups, perhaps a reflection of the nation’s collective mourning of her loss in 2018. A similar pattern emerged for Whitney Houston enthusiasts of both genders, with relatively even support across the board. Other hit masters from past eras, such as Elvis and the Bee Gees, has distinctly older audiences by contrast. 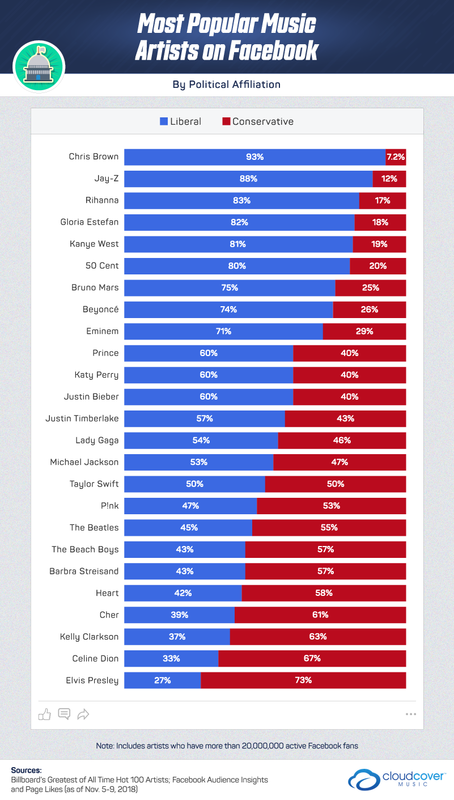 Other artists resonated particularly with younger listeners: Male and female Drake fans were disproportionately likely to be 18 to 24, as were the Taylor Swift faithful. In some cases, however, artists had surprisingly youthful fanbases. Elton John, whose success dates back to the 1970s, had particular success with younger listeners: Sixty-one percent of his male fans and 44 percent of his female fans were younger than 34. The same could be said for the Prince faithful. “The Purple One” has been making music for decades, but 71 percent of his male fans were 34 or younger, and 61 percent of his female fans fit into the same age range. In terms of political orientation, fans of many hip-hop and R&B artists were overwhelmingly progressive: Fans of Chris Brown, Jay-Z, Rihanna, and 50 Cent were at least 80 percent liberal. Eighty-one percent of Kanye West fans were liberal as well, leading to much dismay following the rapper’s outspoken support for President Trump. Some artists with majority-liberal fans have been explicit in their support of progressive candidates: Katy Perry campaigned for Hillary Clinton in 2016, and Beyoncé and Jay-Z famously enjoy reciprocal fandom with the Obamas. Others, however, have been diligently apolitical: Despite a majority-liberal fan base, Bruno Mars has stayed decidedly neutral on such matters. More than 7 in 10 fans of Elvis Presley were conservative, perhaps no surprise for an artist whose most famous political encounter was with Richard Nixon. Yet, other artists with mostly conservative fans have publicly expressed quite progressive views. Kelly Clarkson has increasingly gravitated toward liberal views in recent years, and she endorsed Clinton in 2016. Cher, whose fans were 61 percent conservative, has embraced even more combative techniques, sharply criticizing President Trump on his preferred medium of Twitter. Relationships are a consistent musical theme, but do certain artists appeal to single listeners while others cater to a married crowd? Chris Brown and Drake were the most popular with single fans (ironically, the two have beefed in the past about their shared ex, Rihanna). Maroon 5 was also popular among single folks, perhaps because their tunes often describe messy breakups and the heartbreak that ensues. Conversely, The Black Eyed Peas might provide the right thumping soundtrack to a night out on the town, explaining their particular popularity with the single crowd. Married listeners gravitated toward Connie Francis, who knew quite a lot about nuptials after being married four times herself. Interestingly, Francis claimed the true love of her life was Bobby Darin, the second-ranked artist for married fans. Overall, artists with mostly married fans hailed from bygone eras, including rockers who had their heyday in the ’60s, ’70s, and ’80s. This likely relates to trends in marriage: With Americans waiting longer to tie the knot than ever before, married listeners are a decidedly older crowd on average. Among living artists, Eminem and Rihanna surpassed all others in terms of Facebook fandom (the two have successfully combined their starpower on multiple occasions, including in Billboard Number One “The Monster” in 2013). Justin Bieber and Taylor Swift each possessed more than 70 million fans apiece, perhaps because they’ve enjoyed many years in the public eye as teen idols turned adult artists. Katy Perry, whose reportedly contentious relationship with Swift has been the subject of much speculation in recent years, took fifth place with 67 million fans. Beyonce was also well-represented: On Facebook, the Beyhive was 62 million strong. Turning to deceased musical legends, however, no one held a candle to the King of Pop. 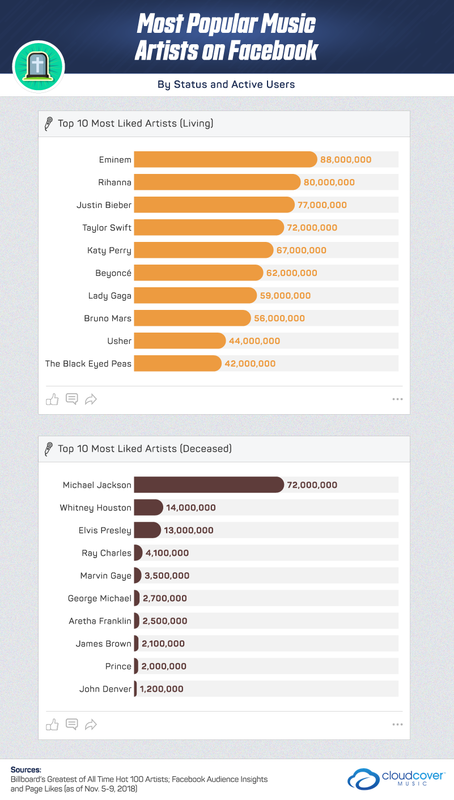 Michael Jackson boasted several times as many Facebook fans as any other deceased artist. Second-ranked Whitney Houston, with 14 million fans, has enjoyed a posthumous resurgence in popularity: The day after her death, consumers purchased more than 1 million of her albums. Elvis captured third place with 13 million fans, despite recent data suggesting that younger listeners are indifferent to his work. 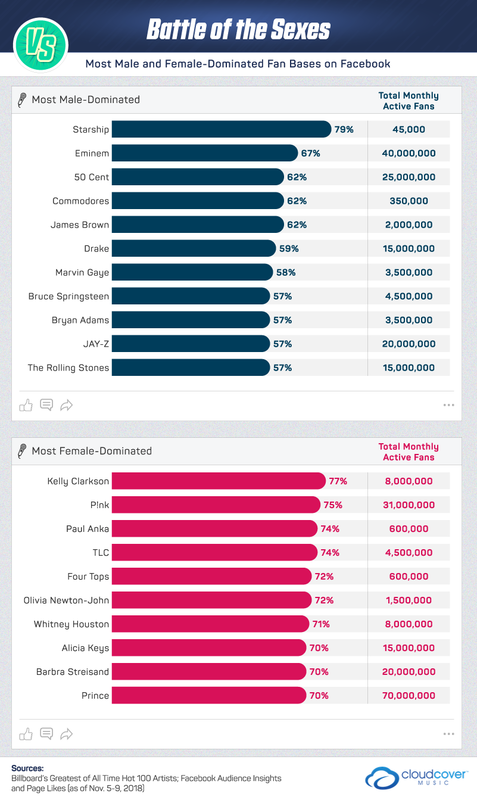 Beyond these three powerhouses, however, no other deceased artist reached five million devotees on Facebook. Our data suggest that musical fan bases are incredibly diverse, and certain stars appeal powerfully to specific audiences. But no one eager to discover new music should be deterred on the basis of demographics. There’s something for everyone in every genre, so long as you listen earnestly. After all, music exists across cultures for a reason: Its appeal is essentially human, and it helps us connect with others in shared appreciation. So the next time you’re deciding which tunes to play, try exploring something new. You may not become a lifelong fan, but you could come to respect the tastes of others. Because musical preferences vary so significantly, it can be hard to know how to please a crowd. For businesses, the struggle to pick the right playlist can be even more difficult, in part because of complex laws concerning music in public places. Cloud Cover Music solves all those problems with a single, affordable streaming platform. We curate dozens of stations suited to consumer needs, and you’ll never need to worry about licensing. To learn how we can be the soundtrack to your success, check out our services today. For this project, we exclusively used the Billboard’s Greatest of All Time Hot 100 Artist list. In regard to the data, we used Facebook Audience Insights from Nov. 5-9, 2018. We also used filters for the world, the United States, individual states, and the demographic breakdowns for each artist/interest. 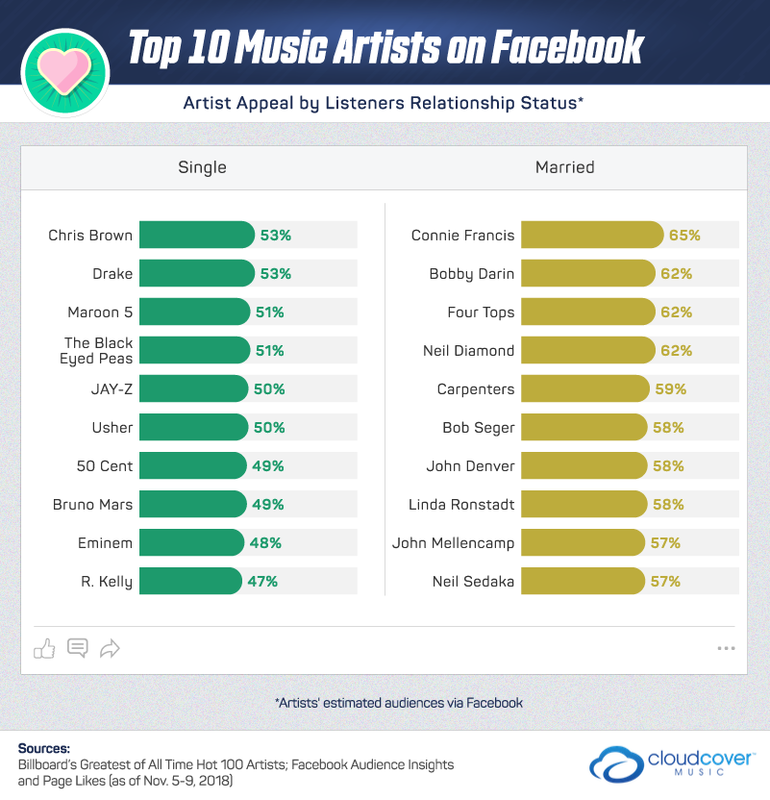 This was used to determine which demographic was the most interested in a particular artist. For Facebook to gather specific demographic breakdowns for each interest, the platform uses the number of monthly active users. A limitation we knew we would encounter is the fact that research has shown younger generations are moving away from Facebook; therefore, the number of Facebook Audience Insights interests may differ from reality. Also, Facebook Audience Insights could have changed from the days in which the data were collected. Keep in mind that an artist’s tour, concerts, and overall popularity in a particular location can vary based on the time the data were collected. Just like the music you love, this content is best enjoyed with others. So if you’d like to share our project with friends and family, go for it. We simply ask that you use our work only for noncommercial purposes and include a link back to this page to attribute us appropriately.